Yesterday my PokerNews reporting colleague Matthew Pitt shared the story of a hand at the World Series of Poker in which the strategy of bluffing failed a player. But sometimes a bluff — even what seems a crazy one — turns out to be the best play to make. Tens of thousands of hands are dealt everyday at the WSOP, but few of them stand out from the rest. On Tuesday, June 10, one such hand did stand out during Day 1 of Event #25: $2,500 Omaha/Stud Hi-Low, a tournament that attracted 470 players and created a prize pool of $1,069,250. 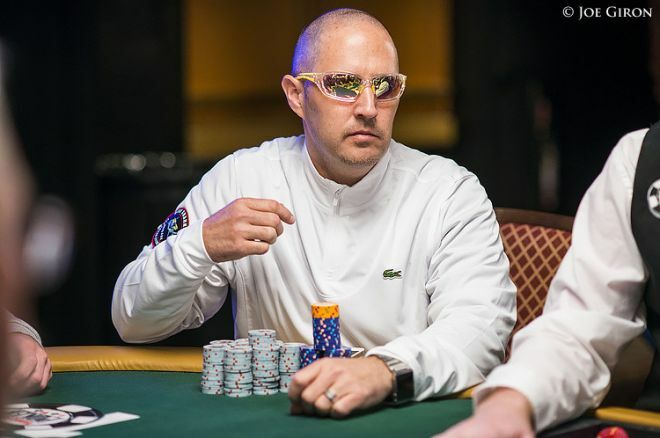 That hand took place between Justin Bonomo, who currently leads the 2014 WSOP Player of the Year race after winning his first gold bracelet plus notching a runner-up finish earlier in the week, and Las Vegas pro Todd Dakake (pictured). The game was seven-card stud hi-low, and it occurred late on Day 1 during a time when players were hitting the rail at a rapid pace. Dakake was sitting on an average stack, while Bonomo had been nursing a short stack for the better part of an hour. Dakake started with the in the hole and the as his door card. The exact cards of Bonomo and a third player in the hand remain unknown. Dakake received two calls, then caught the on fifth. That gave him a flush draw to go along with his open-ended straight. He led out again, the player in between Dakake and Bonomo raised, and Bonomo called. Dakake responded with a three-bet, and both his opponents called. Indeed, Bonomo gave up on the hand and Dakake took the opportunity to show him that his seventh-street card didn’t improve his hand — he’d ended with a bare pair of kings, which was essentially a bluff. “Oh my god, I folded the winner,” a stunned Bonomo admitted while revealing he would have scooped with two pair. Likewise, the other player in the hand indicated that he had laid down wired aces. Indeed, had Dakake checked on seventh street, he would have been giving up on the hand. Instead, he opted to invest one more bet into the pot, which by that time had swelled to approximately 16,000. It took grit to fire another bullet when two opponents had been calling him down the entire time, especially in a split-pot game. With ( ) / / ( ), Dakake didn’t have a low, and he couldn’t expect his pair of kings to be good for the high. It seems almost crazy that he’d try to buy it when Bonomo was looking at pot odds of 10-to-1 to call with his remaining chips, but the urge to survive is strong. Bonomo felt it when he laid down his hand, and Dakake was able to benefit because of it. The moral of the story is this — sometimes crazy works, even against the best in the world.